You're in for a fast paced, sidescroller treat with enough monsters to keep you busy until next Halloween. 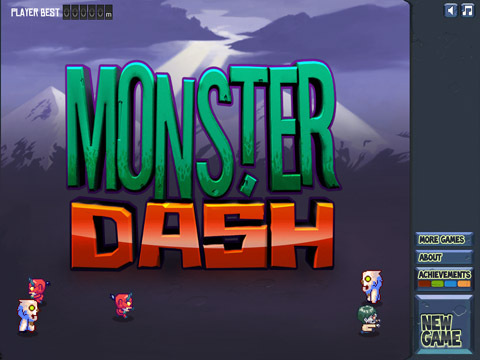 The creative team at Halfbrick Studios, who brought you Jetpack Joyride, brings you another insanely fun game titled Monster Dash! You'll jump with the button located under your left thumb and shoot with the button located under your right thumb. It's a sidescrolling, arcade styled game with the simple objective of killing all of the monsters in your path and making it as far as you can before kicking the bucket. Along your journey, however brief or long, you'll face numerous types of monsters, collect upgrades, new weapons, vehicles and even transport to new stages. It all happens so quick at times, it's interesting. 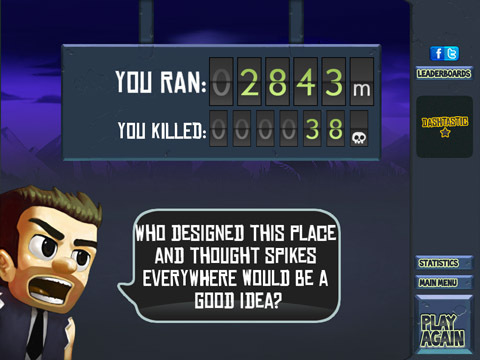 Other obstacles such as spikes and abysses will be provided along with your fearsome enemies. When you start the game you move at a fairly slow pace but as you travel farther distances the gameplay moves much faster! After each run you can view and track your stats and the distance you traveled, try and beat your best score!